Many people have visited Munsiyari in Uttarakhand, but not many people are aware of Sarmoli, a small village situated above Munsiyari that shares its borders with Tibet and Nepal. A lot has been written about the breathtaking views from Munsiyari, but if you happen to visit Sarmoli then you know what this little village offers its visitors. Sarmoli is nestled in the Kumaon region with the Panchachuli range in the background and the Gori Ganga river flows right next to it. In the last couple of years, Sarmoli has gained quite a lot of popularity for its rural tourism and scenic beauty. Sarmoli has a unique ambience of rich culture and heritage, but only a handful people come to know about it. In order to share their inspiring and interesting stories with the world, the villagers run their own Instagram channel called @voicesofmunsiari. One can reach Sarmoli via Munsiyari, which is well connected by motorable roadways. The little village is located at a distance of only 1 km from Munsiyari. If you are planning to travel by train, then the nearest railway station is Kathgodam railway station, which is 280 km from Sarmoli. From Kathgodam you have to hire a cab and reach Sarmoli via Munsiyari. It will take around 10 hours to reach Sarmoli from Kathgodam. Almost 15 homestays are available in Sarmoli which are hosted mostly by the women and will cost you about Rs 700 to Rs 1600 (per person) with food. Homestays will provide you an experience to stay with the villagers and enjoy the local food and culture. Although, the homestays are an integral part of the rural lifestyle, the rooms are nicely decorated with almost all sorts of modern amenities to make it comfortable for the guests. If you willing to enjoy the breathtaking views of the lofty snow-capped mountains, then you should plan to visit Sarmoli between January to March. There are people who cannot stand the extreme cold; they should avoid the proper winter season and visit this place before the monsoon season as these hilly areas experience frequent landslides from July to September. Sarmoli is quite famous for having unseasonal rainfall even during the summertime. So, one should never forget to pack an umbrella and some extra clothes for Sarmoli. The visitors might face network issues sometimes and there can be incidents of power cut as well. The villagers host a week-long annual summer ritual called the Himal Kalasutra festival that attracts a lot of tourists. During this festival, all the locals join together and participate in a 20 km long marathon along an altitude of 8000 feet. Recently, the villagers have also introduced the Birding festival and a photography workshop as a part of the festival. Uttarakhand offers numerous short trekking points with some magnificent views. Out of those, three short treks, namely Mesar Kund, Dhanadhar ridge and Khaliya Top, can be completed from Munsiyari. Mesar Kund: This place, which is also known as Maheshwari Kund, is a perfect location for a family trek in Munsiyari. The trail is marked by stones and passes through oak trees and beautiful Rhododendron gardens. Unlike other treks, Mesar Kund trail is quite an easy climb making it a suitable family exploration. In case you are planning to go for a trek in the monsoon season, make sure you take proper protection to prevent your legs from the blood-sucking leeches. Dhanadhar Ridge: Visitors can get an amazing 360-degree view of the snow-capped mountains, the green valleys and the Gori Ganga river. There is a small temple on the top of the Dhanadhar ridge. 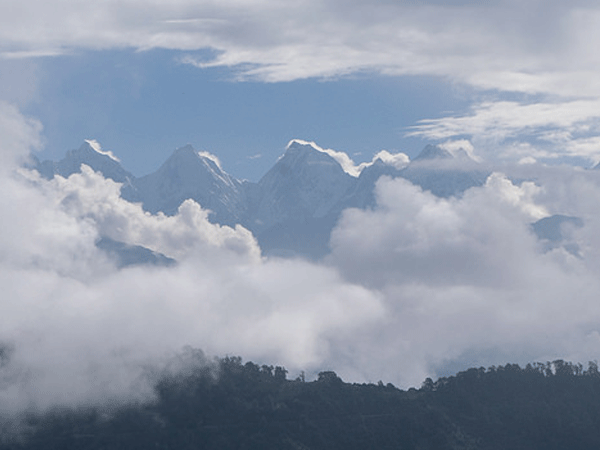 Khaliya Top: Khaliya Top trek is one of the popular treks as it gives a stunning view of the Himalayan range along with a variety of flora and fauna. Situated at an altitude of 3500 metres above sea level, Khaliya Top is a perfect place to visit during the winter season.